1. Mix the flours and waters together, in a small mixing bowl until smooth, cover and leave in a warm place overnight. 2. Each proceding day add 5g white spelt flour and 5g water mix well. 3. After a week to ten days the mix will become bubbly, active and produce a distinct sour smell, it is now ready for use. 1. Warm the oat milk to around 40 degrees c.
2. Combine the flour, salt, and sugar in a mixing bowl then beat in the starter and the oat milk using a whisk, it should form a thick smooth batter. 3. Cover the mixture and leave in a warm place for 1-2 hours, it should be noticeably risen, bubbly and really active before use. 4. 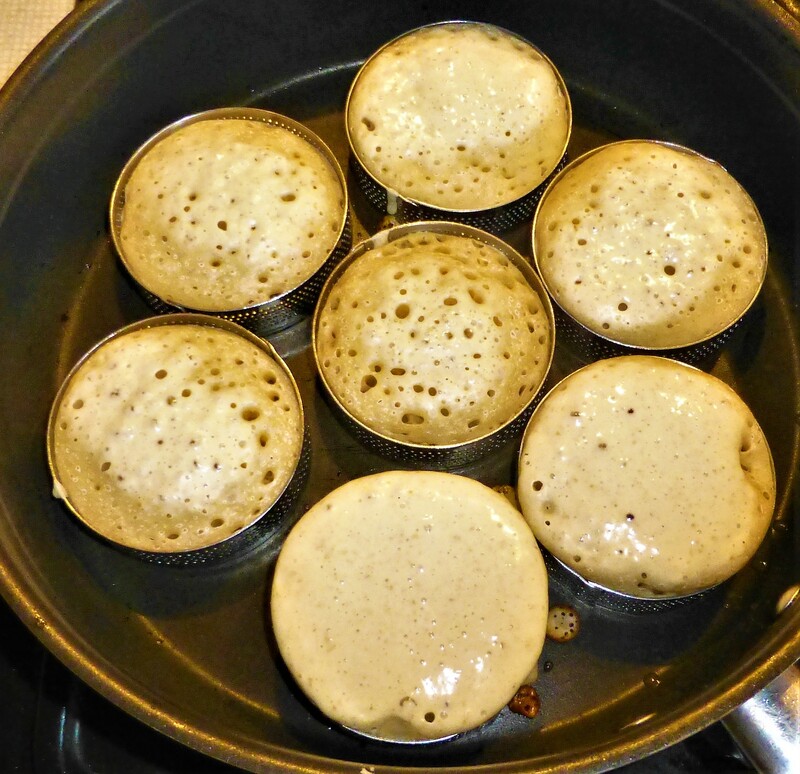 Cooking: Use heavy based frying pan & small metal pastry rings to cook the crumpets, grease pan & rings well. Heat pan to a medium/high temperature, arranging the rings in the pan, before spooning in batter to half fill the rings, turn the heat down to medium/low and cook for around 5 minutes, bubbles then small holes will form on the surface & the batter will completely dry out then turn them over carefully using a spatula. Cook the tops for around a minute, turn out onto a plate with kitchen paper and repeat the process to cook the rest of the batter. 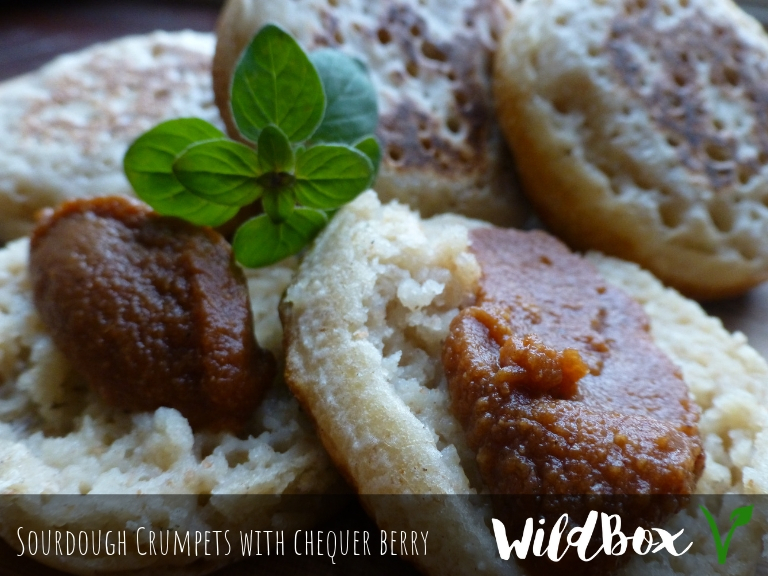 Serve while still warm with coconut oil or alternative spread and the Chequer berry compote. 1. Rinse the chequers, place in a saucepan and cover with water and bring to low simmer for 5 mins. 2. Strain the chequer berries but keep a little of the water. Using a fine sieve push the pulp through using a spoon or spatula, discard stones and skins. 4. Combine with the chequer pulp, then sweeten the compote with syrup. 5. Add in a couple of tbsp of the cooking water. 6. The compote is ready, preserve in a jar or if you want to keep it for some time reheat the whole mixture and carefully jar it up while still hot, invert the jar to force out the oxygen.